Dr. Rein Adamsonil on üle 36-aastane kogemus kirurgias ning ta lõpetas Tartu Ülikooli Arstiteaduskonna 1982. aastal. Ta on Tallinna Kirurgide Seltsi liige 1998. aastast alates ning tema spetsialiteediks The Health Clinicus on bariaatrilised (kaalulangetus) ning plastilis-kirurgilised operatsioonid. Dr. Adamson on üks juhtivaid bariaatria kirurge ning ka kogenuimaid kehakontuurimise kirurge Eestis. Ta on olnud The Health Clinicu partneriks selle loomisest alates ning ta saab vaadata tagasi kirjule karjäärile nii avalikus sektoris kui ka privaatsektoris töötades. Dr. Adamson osaleb pidevalt koolitustel ja seminaridel Euroopas ja Ameerika Ühendriikides. 1983. Estonian Oncologic Centrum – General Surgery, Gastrointestinal Endoscopy courses. 1994. St.-Agnes-Hospital Bocholt, Germany – Laparoscopic Surgery. Dr.H.-J.Hoeppener. 1996. Schnaittach Hospital Germany – Gastrointestinal Endoscopy. 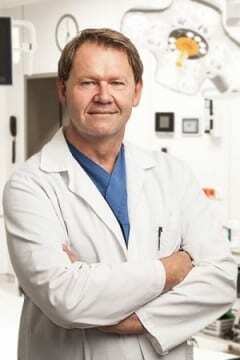 Dr.R.Tomingas. 1996. University of Dundee, Surgical Skill Unit – Essentials of Laparoscopic Surgery. 1997. European Surgical Institute in Hamburg-Norderstedt, Germany – A Course in Laparoscopic Gastric Surgery. 1999. Riga, Latvia – 2nd Workshop on Good Endoscopy Practice. 2000. St.-Marien-Hospital Vreden, Germany – Principes of Reconstructive Surgery for pressure sores, aesthetic and reconstructive mammarian surgery and hand surgery. Dr.A.Lehmköster. 2000. St.-Agnes-Hospital Bocholt, Germany – General Surgery. Dr.H.-J. Hoeppener. 2001. Uddevalla Hospital, Sweden – Minisymposium about Colorectal Surgery. Dr.U.Kressner. 2002. St.-Marien-Hospital Vreden, Germany – Plastic and Reconstructive Surgery, hand surgery. Dr. A.Lehmköster. 2003. European Surgical Institute in Hamburg-Norderstedt, Germany – Minimally Invasive Techniques in Visceral Surgery. 2003. Estoril-Portugal, 13th World Congress of the International Association of Surgeons and Gastroenterologists. 2005. Florence-Nightingale-Hospital, Plastic Surgery Unit in Düsseldorf, Germany. Plastic and Reconstructive Surgery. Prof.Dr.Rolf.R.Olbrish. 2005. Prague, Czech Republic. 15th World Congress of the International Association of Surgeons and Gastroenterologists. 2006. Berlin, Germany. 14th International E.A.E.S Congress. Postgraduate Course“ Bariatric Surgery“. Course Director Dr.Rudollf A.Weiner. 2006. Florence-Nightingale-Hospital, Plastic Surgery Unit in Düsseldorf, Germany. Plastic and Aesthetic Surgery. Breast Cancer Center. Prof.Dr.Jutta Liebau. 2007. Tallinn, Estonia 1st ESGE Live Endoscopy Workshop in the Baltic States. 2008. Jean Mermoz Hospital, Lyon, France. Treatment of Obesity by Intragastric Balloon System. Surgical Treatment of Morbid Obesity by Adjustable Gastric Band. 2008. Florence-Nightingale-Hospital, Plastic Surgery Unit in Düsseldorf, Germany. Plastic and Aesthetic Surgery, Breast-Cancer-Center. Prof.Dr.Jutta Liebau. 2008. Capry, Italy. 3rd Congress of the International Federation for the Surgery of Obesity. 2009. Paris, France. XIVth World Congress of the International Federation for the Surgery of Obesity. 2010. Los Angeles, California, USA. XV World Congress of the International Federation for the Surgery of Obesity and Metabolic Disorders. 2010. 2nd Baltic Bariatric Symposium. Tallinn, Estonia. 2011. Florence-Nightingale-Hospital, Plastic Surgery Unit in Düsseldorf. Abdominoplasty, Breast Surgery, Liposuction. Prof.Dr.J.Liebau. 2011. XVI World Congress of the International Federation for the Surgery of Obesity and Metabolic Disorders. Hamburg, Germany. 2012. International Symposium for plastic surgeons – Secondary Optimizing Aesthetic Surgery Salvage Procedures After Pitfalls in Aesthetic Surgery. Munich, Germany. 2012. 7th Frankfurter Meeting. Laparoscopic Surgery for Obesity and Metabolic Disorders. Germany. 2013. 3rd Baltic Bariatric Symposium. Tallinn, Estonia. 2013. International Surgical Week. Helsinki, Finland. 2013. Florence-Nightingale-Hospital, Plastic Surgery Unit in Düsseldorf. Post-Bariatric Surgery, Reconstructive Breast Surgery and Aesthetic Surgery. 2013. Meeting “Decision Making in Bariatric and Metabolic Surgery“. Rome, Italy. 2014. Practical course: Surgery of massive weight loss patients. Printzlau Private hospital, Denmark. 2014. Laparoscopic Surgery for Obesity and Metabolic Disorders. 8th Frankfurter Meeting. 2014. Practical course: Breast surgery. Breast reduction. Düsseldorf. Florence-Nightingale-Hospital. 2015. Advanced course in Revisional Procedures & Management of Complex Cases in Bariatric Surgery. AZ Sint Jan hospital, Bruges, Belgium. 2015. 12th BEAULI Workshop of fat grafting. Birkenwerder. Berlin, Germany. 2017. 5th Course of Live Surgery of Fat Grafting. Malaga, Spain. 2017. Practical course: Surgery of massive weight loss patients. Printzlau Private hospital, Denmark. 2017. The 22nd World Congress of the International Federation for the Surgery of Obesity and Metabolic Disorders, London, United Kingdom. 2018. Practical course: Abdominal Wall Reconstruction Europe. Royal College of Physicians. London, United Kingdom. 2018. 6th Course of Live Surgery of Fat Grafting. Malaga, Spain. 2018. Laparoscopic Bariatric Surgery Workshop. Brussels, Belgium.